What am I doing in the Caucasus? “Stephen, what the hell are you doing in the Caucasus?” spluttered a German friend in a message back in the spring. Having spent some six weeks in Georgia I have seen with my own eyes that the country is indeed prodigiously beautiful. This wonderful land of mountains and mystery drew me and continues to draw me. I have spent the last month back in Britain to attend my daughters’ graduation ceremonies, to see family and friends and to reflect on my travels so far. I can now give a fuller account of what the hell I am doing in the Caucasus! It is about more than the physical beauty of the land, though that is an important part of it. At one level, I am on a Boys’ Own adventure and one old friend suggested that the occasional mishap would be a good idea. I’ll see what I can do! The trip shouldn’t be too cosy and predictable. The journey is also unfolding on the level of ideas, thoughts about the contemporary world and lessons to be learned from the areas that I am visiting. I have experienced Georgia as a country where the pace of life is relaxed, where traditions of good food and wine and hospitality are very much alive and where the natural world is rich and exuberant. I had the Georgians down as bons viveurs who knew how to enjoy themselves while looking after their environment much better than most. Yesterday I had a shock. I checked to see where Georgia stands in the World Happiness Report, an annual study launched in 2012 which attempts to say something sensible about levels of well-being in different countries. Georgia is in 130th position, below the Palestinian Territories, Ukraine, Iraq, Congo (Kinshasa), Liberia and Zimbabwe. None of these is exactly an exemplar of the good life. These countries also fare better than Georgia’s neighbour Armenia, which is 127th. The list encompasses 158 countries in all. Either I have been taking a hopelessly romantic, wrong-headed view of Georgia or the “science of happiness” is spewing out bilge. I am about to go back to Georgia and will give myself the task of digging deeper and trying to find out how people perceive their lives. What’s working for them, what’s not? Are the peoples of the South Caucasus really some of the most miserable folk on the planet or is this a heinous libel? Every individual journey unfolds against a backdrop of events in the world as a whole. In a complex global society we do our own sense-making with help from others. My sense of what is going on internationally informs my writing and my idea of why I am in the Caucasus. So, here are two authors who have influenced my thinking during my break from travels. There have been strong stirrings of revolt against the central role of the market for some time, but I sense that now there is a groundswell which will bring big changes. The other author is Pope Francis, who in June published in eight languages an encyclical entitled Laudato Si’, (Praise Be to You), on care of the environment. “The Earth, our home, is beginning to look more and more like an immense pile of filth,” writes the pope, who is strongly critical of the current importance of the market in our culture. The encyclical is a talking point with, inevitably, enthusiastic supporters and critics. The pope is stirring things up nicely. Thank you Your Holiness. To relate all of this back to Georgia, when I look at the country with an outsider’s eye I see an international leader. This country is not a pile of filth. Nearly 40 percent of its land is still covered with forest and it can boast of bears, wolves, lynxes, jackals and eagles, just some examples of its gloriously rich fauna. This part of the world has also retained the pre-capitalist values identified by Harari in more convincing fashion than, say, Britain. In Georgia, the family has most emphatically not collapsed. Extended families live together in one house and in the countryside practically no one lives alone. The local community, while under strain in the villages because of the universal phenomenon of the flight to the cities, is still very real, with neighbours dropping in to help one another with tasks such as planting potatoes. 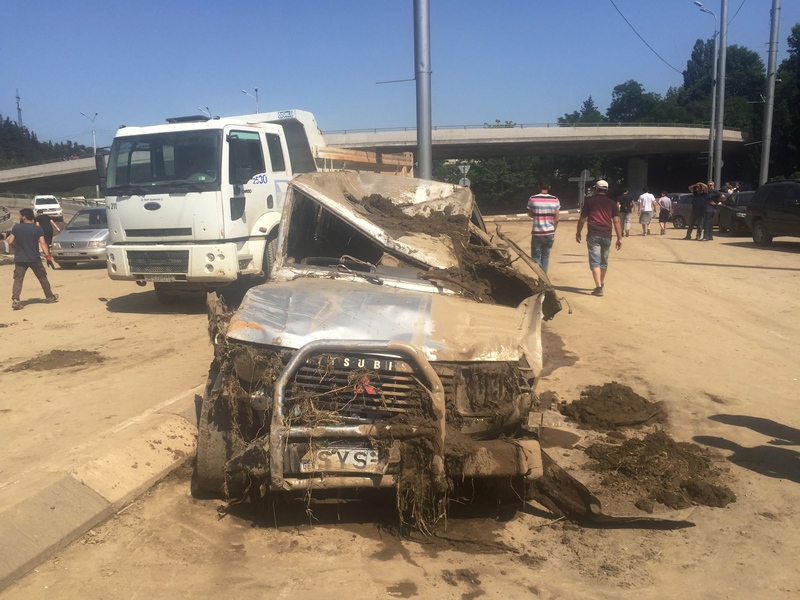 I was in Tbilisi in mid-June when a torrential downpour hit the Georgian capital, causing the deaths of at least 20 people and enabling wild animals, including a hippopotamus and a white tiger, to escape from the zoo. 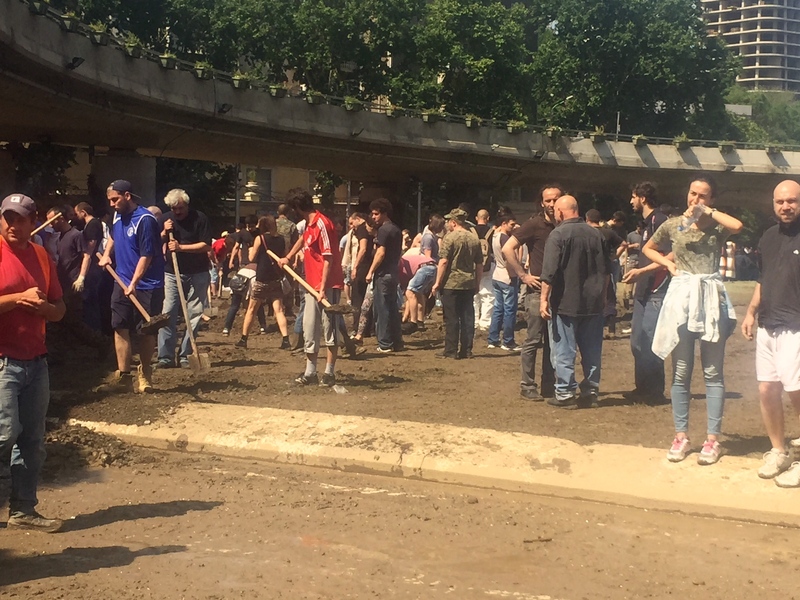 Many people took part in the clean-up and I certainly picked up a sense of community, of social solidarity. So why is Georgia in 130th position in the World Happiness Report? Watch this space for my attempts to give an answer, whilst also coping with the occasional mishap, delving into history and describing the views. See also article The end of capitalism has begun by Paul Mason, Economics Editor of Channel 4 News in The Guardian of 17 July 2015.